Ensure speed to market, innovation, and superior quality. Cigniti is a leader in providing test automation services and has built a dedicated Automation Center of Excellence (ACoE) backed by a decade of experience in executing test automation engagements for global clients & a large pool of test automation experts. Cigniti Test Automation Accelerator Kit comprises of pre-built test automation scripts, utilities, process assets and frameworks, and has helped many companies in implementing successful test automation initiatives. Cigniti’s test automation strategy enables organizations to increase release velocity, reduce time to market and reduce overall testing effort resulting in a significant return on investment (ROI). Cigniti has developed a tool and technology agnostic, plug-and-play test automation framework with pre-built interfaces to CI servers, application lifecycle management tools and defect management tools that fully support the majority of test automation tools adopted by organizations. Cigniti invests over a $1mn annually for developing intellectual property and has committed partnerships with industry leading automation tool vendors to complement innovation. Cigniti is also an active contributor in open source platforms for test automation and is a silver sponsor of Selenium. Cigniti has also developed a host of pre-built automated test suites for industry leading 3rd party products like SAP, Oracle, PeopleSoft, Salesforce, SAP Hybris, MS Dynamics CRM, and Work Day. Cigniti’s ACoE comprises of a dedicated team of over 50 Architects and 700 test automation experts who develop test automation IP/accelerators by leveraging industry trends, best practices, and reusable frameworks/libraries. By leveraging Cigniti’s enablers and the assets developed by the ACoE, organizations have reduced efforts in developing test automation framework by over 80%, saved more than 50% in test automation script development efforts, and realized over 70% reduction in overall regression testing efforts. Cigniti utilizes proprietary test techniques to identify automatable manual tests. 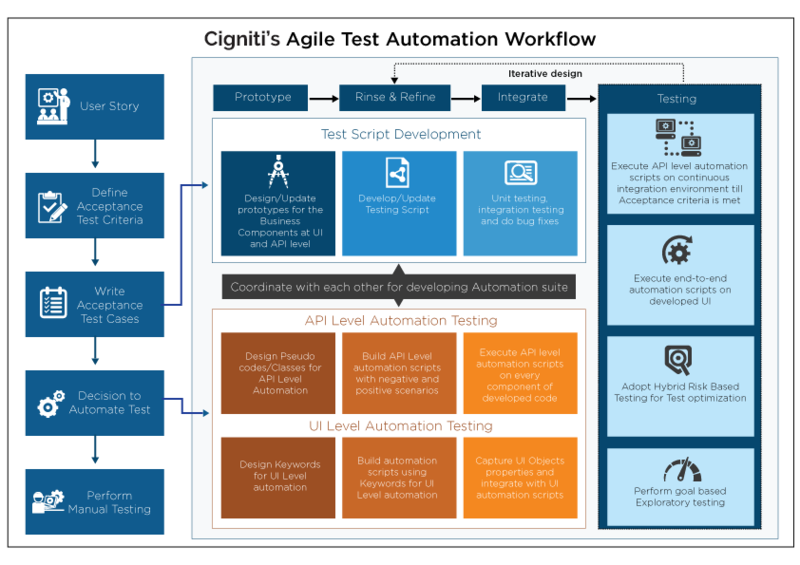 Cigniti’s test automation methodology (and team) is well accustomed to Agile and DevOps environments ensuring consistent ROI during the entire agile lifecycle. I’ve been quite satisfied with the projects that I’ve worked with them and yes, I’d be willing to work with them on future projects that we do. The pace at which Cigniti was able to deliver the work in a very high quality was outstanding in terms of delivery. I’m actually very excited about the relationship that we have with Cigniti. We look forward to partnering with Cigniti for future project needs and would like to recommend Cigniti to organizations with similar requirements. We been working with Cigniti team. The members quickly learned our business processes as well as our systems, and adapted those processes to fit our team as well as the Freeman culture. Consult our experienced team of career testers for your Testing requirements. CI Server Tools – Jenkins, Bamboo, Travis, etc. Test Management Tools – HP ALM, QTest, Zephyr, QA Complete, TestLink, etc. Test Automation Tools – HP UFT, Selenium, Testcomplete, EggPlant, Ranorex, Appium, Cucumber, etc. TAF’s support for extensibility, Service Virtualization, portability, forward integration, and just-in-time reporting add value leading to more than 50% overall cost savings in automation design, execution cycle, and maintenance. Smart tagging of test cases helps selection for execution based on “release objectives”. Continuous integration testing with leading CI server tools and multiple test data sources. Compatibility with leading ERPs, packaged solutions, Web, mobile, and thick-client applications. Large repository of keywords for a common, scalable knowledge base that promotes reuse of functional libraries. Dashboards with in-depth visibility into project status, test execution results & analysis reports. Single point maintenance methodology reduces complex operating costs, overall testing time, & brings about quicker ROI. Enables clients to run comprehensive regression tests for major and minor releases improving improve the overall quality of applications. Integration with open and commercial tools to make validation of complex business processes easy. 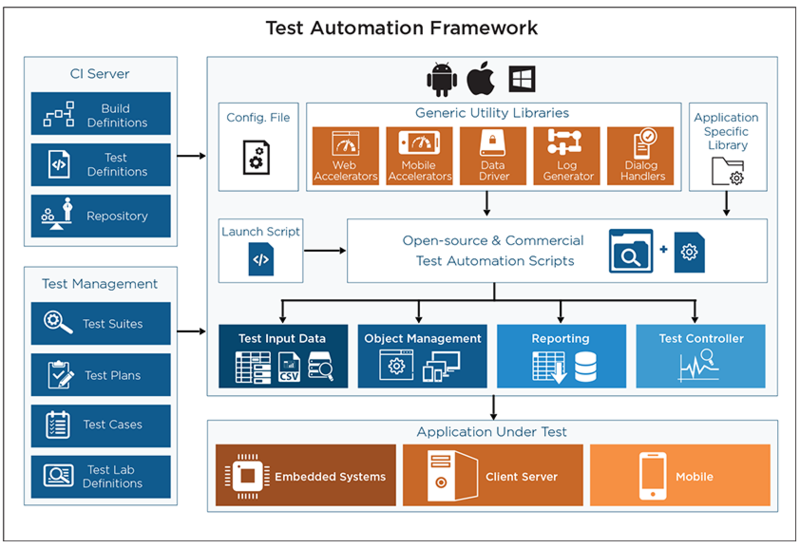 Cigniti’s Test Automation Accelerator Kit (TAAK) enables end-to-end automation of applications across the SDLC helping enhance the quality of testing. TAAK supports thick-client (desktop) applications, web-based applications, mobile apps, and more. 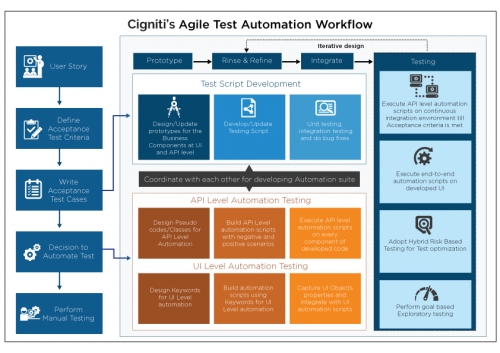 Cigniti is a thought leader of automated testing in Agile-based testing environments that create a strong base for organizations. We share our best practices on software testing and quality by means of blogs, white papers, leadership articles, webinars, and Podcasts. 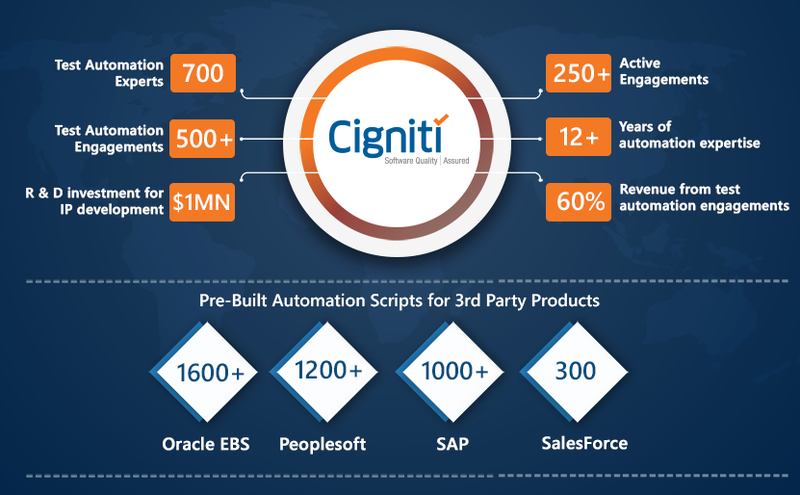 A quick view of Cigniti’s partners – who also are industry leading automation tool vendors. Cigniti provides customized automation testing solutions to its clients. 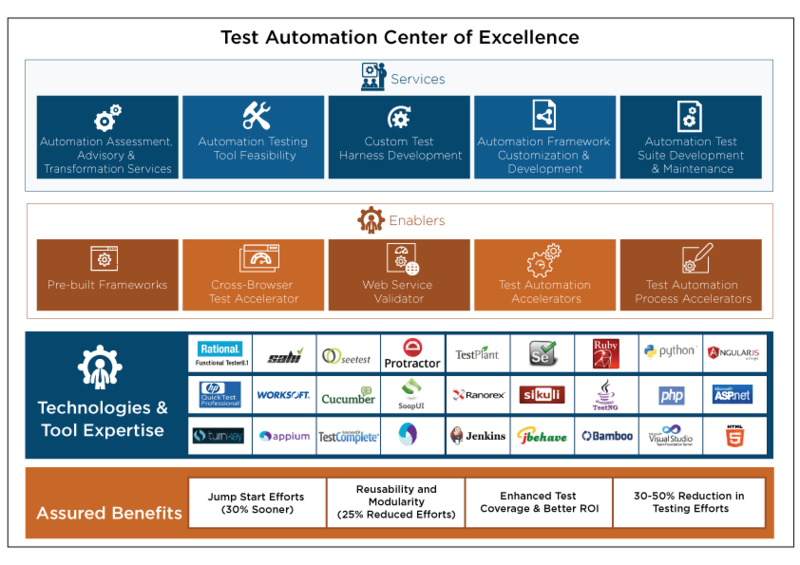 Below is a partial list of our clients who trust us for their test automation needs. — Diego Lo Giudice, VP and principal analyst at Forrester Research.